The Learning Technologies SIG has much to offer its members. From scholarships to CPD schemes, we aim to challenge and inspire teachers to work on the cutting-edge of technology and pedagogy. See our list of benefits below. We offer grants to our members to attend and present at conferences around the world. Members have previously been awarded grants to conferences for ELT Malta, TESOL Greece, Digital ELT Ireland, FAAPI Argentina, CyTEA, International House Barcelona and the BELTA conference. We have already chosen roving reporter and CPD travel grant winners for IATEFL Liverpool 2019 and will soon choose our roving reporter for IH Barcelona 2019. We give approximately 6 to 8 grants per year so it’s well worth availing this opportunity to become one of our chosen grant winners. Our CPD scheme includes sponsor scholarships and opportunities to attend free courses offered for our members. Members will get access to our ebook called Teaching English Reflectively with Technology. This ebook is a project of IATEFL’s Learning Technologies Special Interest Group in collaboration with TESOL’s Computer-assisted Language Learning Interest Section. We are also collaborating on books with the ELT Council Malta and the 2nd Annual Online Conference in Research into Using Technology for Language Learning, jointly organised by OLLReN (Laureate and CUP) and LTSIG. 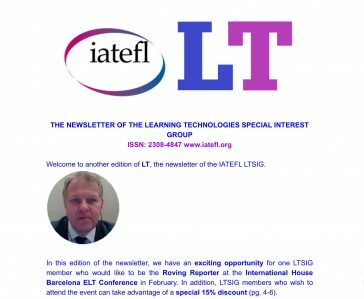 The LTSIG e-newsletter, called LT, is sent by email to members only. Our Newsletter editor will produce six editions each year. The most recent one was released on 30 November 2018. It includes articles published on our website and LTSIG related news and announcements, as well as exclusive content. It comes as an e-newsletter, but from November 2018 onwards will be available in a flippable version, too, with its own ISSN. Our members’ area is currently under construction and is dependent on IATEFL Head Office. Once ready we will be able to offer members access to event recordings, back issues of the newsletter, podcasts and the aforementioned e-publications.